7549 W Sand Lake Rd. Some of my first childhood dining memories began at the The Melting Pot. The first Melting Pot opened in April 1975 in Maitland, Florida and served only three items on its menu. 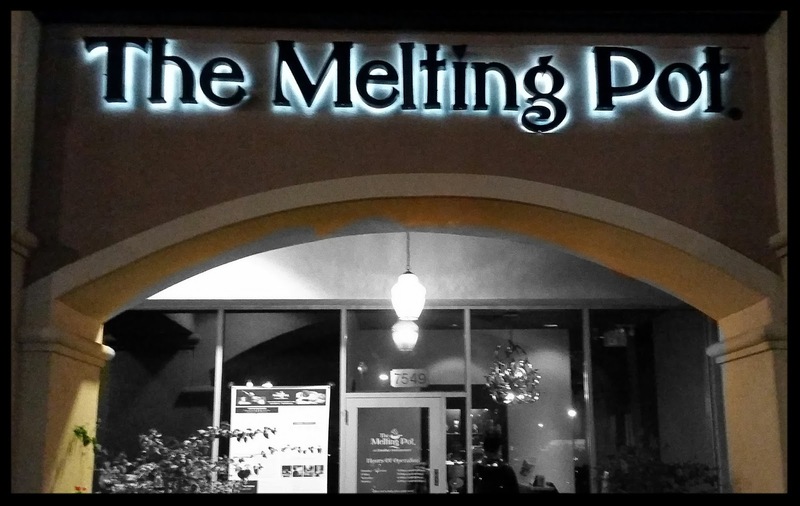 With permission from the original owners, Mark, Mike and Bob Johnston opened The Melting Pot of Tallahassee in 1979. As the restaurant expanded its franchise, the menu grew larger. In 1985, the Johnston brothers purchased all rights to the Melting Pot brand. Sadly, on June 1, 2008, the original location in Maitland closed, but there were already enough additional Melting Pot locations to replace the original one. My family has always been very fond of fondue, and that is why I have always been a big fan of The Melting Pot. I mean who can refuse a relaxing four course experience that begins with a cheese fondue prepared table side with artisan bread and vegetables for dipping and a fresh salad while your entree pot heats up followed by a decadent chocolate fondue as the finale? If you love The Melting Pot as much as I do, you may not think things could get any better, but I must warn you, the all new "Dip Into Summer" special is rather awesome. I always order my fondue with the oil for frying...call it a southern thing if you will, but the Old Bay seasoned broth for boiling with this limited time offer has me rethinking my position. In addition to a ridiculously good BBQ brisket cheddar fondue, the all new “Dip Into Summer” special features pacific white shrimp, scallops, lobster & shrimp ravioli, andouille sausage and succulent crab claws. Instead of oil for frying, this special is prepared with an Old Bay seasoned cooking broth that features fresh corn on the cob, red potatoes and andouille sausage. The BBQ Brisket Cheddar fondue was outstanding. It features chunks of savory smoked barbecue brisket, medium sharp cheddar and Emmenthaler Swiss cheeses with fresh tomatoes and scallions. The usual dipping items of various breads, green apples and a vegetable assortment are included with this as well. I'm not usually a fan of wedge salads, but this was quite tasty. A crisp iceberg wedge is served with sliced Roma tomatoes, Gorgonzola cheese, hardwood smoked bacon and peppercorn ranch dressing. The Summertime Sipper is a perfect drink for this time of year. One sip and you will feel like you are at the beach relaxing. This cocktail contains fresh watermelon and cucumber with Malibu rum and fresh lime juice to create a refreshing cocktail you’ll want to sip all summer long. For all the beer drinkers out there, the Melting Pot has you covered as well. This refreshing beer flight from Sam Adams Summer Ale and Lemonade, features Black Cherry Blush, Ruby Red Crush & Lively Lemon flavors in 7oz servings. Each flavor also available in full 12oz size. Last, but certainly not least, is the Banana Split Chocolate Fondue. This dessert combines all the flavors of a classic banana split into a decadent milk chocolate fondue with cherries on top. The summer menu is available now through July 31st and also includes options to add a lobster tail and 4 more crab claws for an additional charge. I really enjoyed this dining experience and taking a detour from my normal fondue selections. If you love summertime, seafood, cool cocktails and great fondue, then head to your nearest Melting Pot before this special ends.